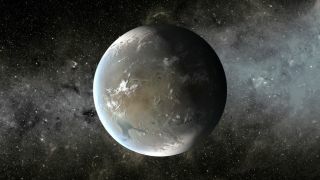 This artist's concept shows Kepler-62f, an exoplanet in the habitable zone of its host star, which is located about 1,200 light-years from Earth in the constellation Lyra. Researchers think Kepler-62f may be a "water world." The bright glint of alien oceans may be visible from afar, allowing astronomers to flag potentially habitable exoplanets. As Earth travels around the sun, it moves through phases much like the moon when seen from afar. The planet's oceans reflect a great deal of light, especially during the crescent phase. The same principle should apply to exoplanets, researchers say. Although a host of satellites monitor Earth, few eye the planet as a whole. As a result, many exoplanet scientists turn to models to understand how Earth might appear if it were a distant alien world. However, the accuracy of these models can be difficult to gauge without observations to verify them. Scientists have made a few attempts to address this issue. In 1993, for example, Carl Sagan and other researchers used observations made by NASA's Jupiter-studying Galileo spacecraft during a 1990 flyby of Earth to search for signs of life on our planet. An image of Earth, taken by NASA's LCROSS satellite, shows the planet in its crescent phase. The smaller light to the left is the moon. And in 2009, NASA's Lunar Crater Observation and Sensing Satellite(LCROSS) moon mission observed Earth at several phases, including near-full and crescent, in order to calibrate its instruments. Robinson and his colleagues analyzed these data, and found that the near-infrared and ultraviolet/visible light observations provided an approximation of how Earth might appear through extreme phases across various spectrums. Their study was published in 2014 in The Astrophysical Journal. "LCROSS looked at Earth for calibration, but its measurements were good for science," Robinson said. The results showed that, although less of Earth's surface was visible during its crescent phase, the brightness of the planet increased due to the light reflecting off its oceans. In visible light, the glint increased the planet's brightness by as much as 40 percent; in the near-infrared, Earth shone nearly 80 percent more brightly, Robinson said. Robinson was also a co-author on a different paper that examined similar, though less detailed, observations of Earth using NASA's Deep Impact spacecraft (which performed up-close examinations of two different comets, in 2005 and 2010). The observations performed by LCROSS — the first high-spectral-resolution observations of Earth in its crescent phases — lined up well with predictions based on existing models, Robinson said. However, similar results gained from observations of an exoplanet would not automatically be signs of an ocean, he cautioned; clouds and ice could also affect the brightness of a planet. Follow-up studies of the exoplanet's atmospherecould reveal more about the world's potential habitability. Still, an apparent glint from an exoplanet ocean would be an exciting find, Robinson said. "We conclude that the detection of such a feature would be intriguing, and would certainly indicate that a more detailed observational follow-up of the planet was warranted," he and his colleagues wrote in their 2014 LCROSS paper. Follow Nola Taylor Redd on Twitter @NolaTRedd Follow us @Spacedotcom, Facebook or Google+. Originally published on Space.com.